Topics: Contact Us, Notify Me, Affiliates, Co-brand Partnerships, Mastering The Trade, and Find It At. Age: It went live on May 21st 1998, making it over 19 years, 10 months old. 150 users visit the site each day, each viewing 13.00 pages. 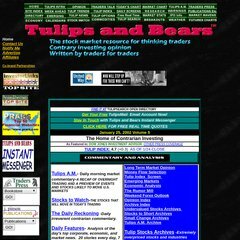 There are 2 Nameservers, ns2.tulipsandbears.com, and ns1.tulipsandbears.com. It is hosted by American Registry For Internet Numbers (Virginia, Chantilly,) using nginx/1 web server. Its IP Number is 74.122.192.150. PING (74.122.192.150) 56(84) bytes of data. The server is faster than 69% of measured websites, at 3242 milliseconds. Also a time of 12.8 ms, is recorded in a ping test.